Jensen is a sophisticated "masonry-style" portfolio template. The project detail view slides in from the right when opened. Its Index page accommodates multiple galleries, each with as many images as you want. Jensen dynamically and intelligently reflows your galleries based on the size of the browser window. By default, the first image in a gallery will be used as its thumbnail, but you can override that by uploading an image to Thumbnail Image in that gallery's Page Settings. When you click on a thumbnail, the images in a project are displayed vertically, and the thumbnails of all your projects are at the bottom of the page. You can set the size of the gallery thumbnails in the Index with the Project Width setting under Size & Values in the Style Editor (note that this is a maximum width). Set the width of the overlay that slides in to show the project details with Project Detail Width under Sizes & Values. Page Width, under Sizes & Values, sets the width of the blog and regular pages. Set the spacing between the thumbnails with Project Spacing, under Sizes & Values. Show the project title under the thumbnails with Poject Title, under Options. Set the transparency of the thumbnails with Project Opacity, under Sizes & Values. Project Title Color sets the color of the title under the thumbnails (if you have it set to Show), while Project Detail Text Color and Project Detail Headings Color set the color of the text in the Project Detail drawer that slides out. The Index Page consists of a series of galleries. All galleries filed under Index will be displayed in the masonry-style layout described above, rather than as individual gallery pages. Jensen works best with a fairly large number of galleries in the Index. 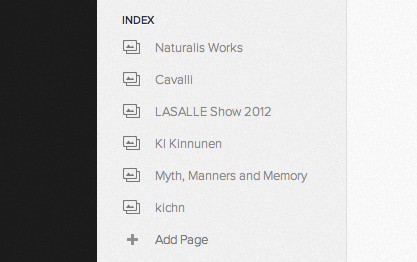 To create this, add a new gallery page under the index section rather than the main navigation. Galleries that are added as pages will appear differently to galleries under the index. To add a title and description for any gallery (either a standalone gallery or a gallery in the Index), click into Page Settings at the top right corner of the Gallery View. The Navigation Title will appear as a link in the index navigation. The Page Title will appear at the top of the Project Detail view. The description will appear under the images in the Project Detail view.